The visit to the Bailin Ch’an Temple occurred between the 9th and the 12th of October, 2012. The tour of the Vietnamese Ch’an delegation was led by Abbot Xin Xing of Baima Temple, who took the group to the Bailin Ch’an Temple where they received instruction. The resident master of the temple received the delegation with the utmost hospitality. On the evening of the 9th of October, the Vietnamese Ch’an delegation – which numbered more than fifty people – gathered at the Bailin Ch’an Temple for three days of study and learning activities. Master Chuan Xue was responsible for arranging the reception. Master Chuan Xue led the delegation on a visit to ceremonial tower commemorating the founding patriarch, and then on a tour of all the temple grounds. The delegation then listened to a Dharma-talk, and then went on a visit to the Linji Ch’an Temple situated in Zhengding County – where they paid their respects in the Ch’an the Hall to the founding ancestor – Ch’an Master Linji. For three days, the delegation took part in extended sessions of Chan meditation practice in the Manjushri Hall. Masters Cun Jie and Chuan Xue guided the foreign delegation that had travelled a long way to be in the heart of China, by emphasising the Zhao Zhou tradition of Ch’an practice, ritual and explanation. During the visit, the Temple Supervisor – Master Ming Ying – was also enthusiastic to meet the Vietnamese Ch’an delegation. On the evening of October the 10th, the master had an informal meeting with the guests on the ‘Finger (Pointing at the) Moon Terrace’, and then led the group in paying their respects and praying for blessings for all beings, at the commemorative tower dedicated to Master Zhao Zhou. 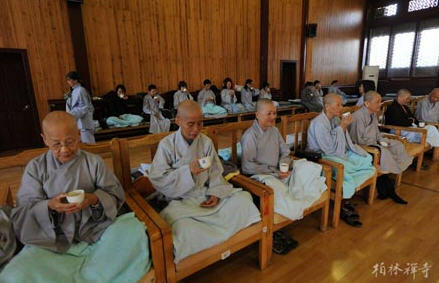 On October the 11th, Master Ming Ying guided the group through a tea-ceremony held at the same tower of the patriarch.